Francisco Román Alarcón Suárez is an Spanish professional football player who currently plays for Real Madrid and the Spanish national team. He was born on 21 April 1992 in Benalmádena, Spain. He plays the role of an attacking midfielder, for which he is regarded as one of the best in the world. Isco began his career with PDM Benalmádena in 1997 when he was just a 5 year old. In 1999, he got transferred to Atlético Benamiel. He remained there till 2009 when he joined Valencia, which got him his youth career started. Isco deputed with Spain's U17 in 2009 FIFA World Cup where he also scored three times against United Arab Emirates, Uruguay and in the third place match against Colombia (1-0 win) and helped his nation finish third. In 2011, he represented his country in the U-20 World Cup held in Colombia and scored one goal which was a quarter-final exit. Isco made his debut with the senior Spanish squad on 6 February 2013 by playing in the last 30 minutes in a match against Uruguay, which was a 3–1 win for the team. In 2011, Isco appeared at the UEFA European Under-21 Championship in Israel and he scored goal in the final and finished the competition with the Bronze Boot (3 Goals). On 15 November 2014, in the UEFA Euro 2016, he scored his first international goal for Spain in the qualifying match against Belarus held in Huelva and thus opening a 3–0 win. 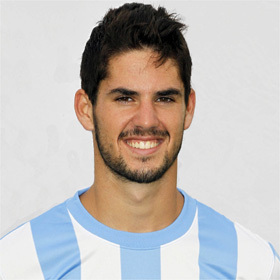 After being in Valencia from 2010 to 2011 as a youth, Isco shifted to Málaga in mid-July 2011 in a €6 million deal. On 21 November 2011, he scored his first goal for the club in a 3–1 away win against Racing de Santander. On 17 June 2013, he made it public that he had received offers from Real Madrid and Manchester City. However, he put on hold the final choice for the UEFA European Under-21 Championship final. On 27th June 2013, he finally signed a five-year contract with Real Madrid for €30 million and was the first signed of the newly appointed manager Carlo Ancelotti. He made his official debut for the club on 18th August 2013 recording an assist and a goal, the goal scored by him being the final of the club’s 2–1 home win over Real Betis.